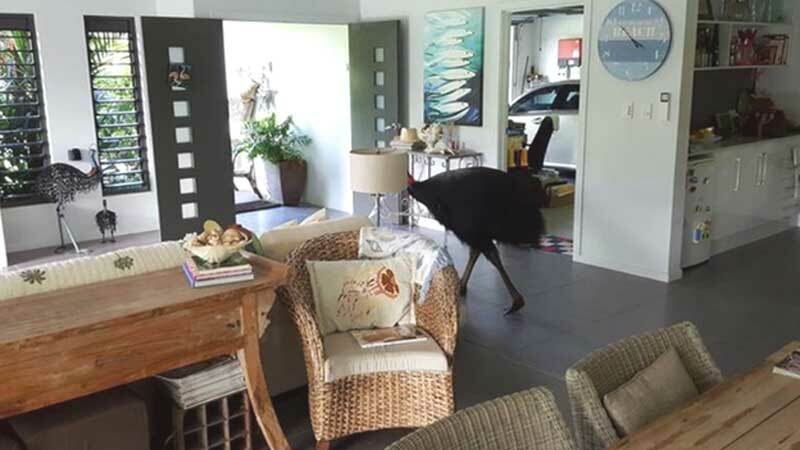 A wild cassowary wandered into a family home in far north Queensland, Australia, sending its occupants running for cover. 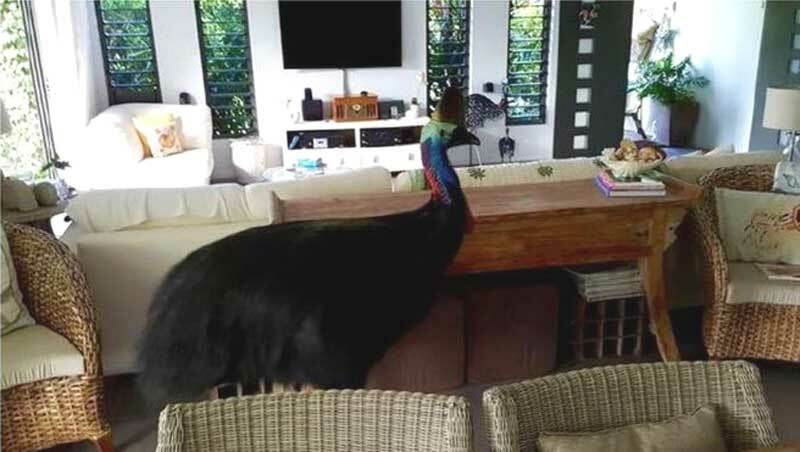 Sue and Peter Leach said they were preparing dinner when a male cassowary wandered into their home at Wongaling Beach, south of Cairns. 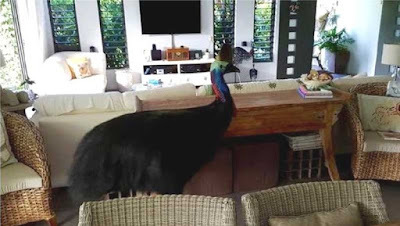 "He has been walking past our place, through our yard and into the rainforest for almost four years now - I think he made a wrong turn," Mrs Leach said, adding that they had named the cassowary Peanut. "He wandered in very casually, he wasn't spooked at all, looked around, thought this wasn't for him and just walked straight out the front door." She said their encounter with one of the world's most dangerous birds sent her running for cover. "My husband was in the dining room and said, 'Oh, we've got a visitor'," she said. "So he crouched down behind the dining room table and I took off into the front yard, out on the driveway, and as I was running out I was saying, 'take some pictures', which he did." Mrs Leach said Peanut was the perfect dinner guest. "He didn't damage anything or knock anything over, he walked around without spotting the fruit bowl or without doing a poo, which was great," she said. "Because of the berries they eat, their poo is quite purple and could stain your tiles." Southern cassowaries are endangered and found only in small pockets of far north Queensland and Papua New Guinea. They grow up to two metres tall, can run at speeds of up to 50 kilometres per hour and are equipped with three sharp claws on each leg.